I hope to win - great books! These books are so interesting and I love that you put them together for all to enjoy! Would love to have both! I follow you on FB and just love the posts. Thanks for the chance at the giveaway! This would definitely be my favorite giveaway that you've had! I would absolutely LOVE to have your books and would do a review on my blog! Thanks! Love your old children's books too...and the historical books and classics! I better stop there! lol Enjoy your day! Wow, the best set I've ever seen (since I have been following you)! Let's try to win this one. It's my very first entry. I love these books, and I love your facebook page! I've wanted these books for so long but haven't been able to afford them, it would be awesome to win them! Thanks for your generous giveaway... would love these books! I love your books and posts! Finding Items in books is a awesome feeling, a peak into someones life. I have to say i am guilty of enjoying this pleasure. would love the chance to win your books and see what you have. Thanks for the giveaway :) I hope I win! I have always collected book marks both ones I find and ones I make myself. I love to include a great book mark with a book I am giving away. From lost to found again and then immortalised in two fascinating books. 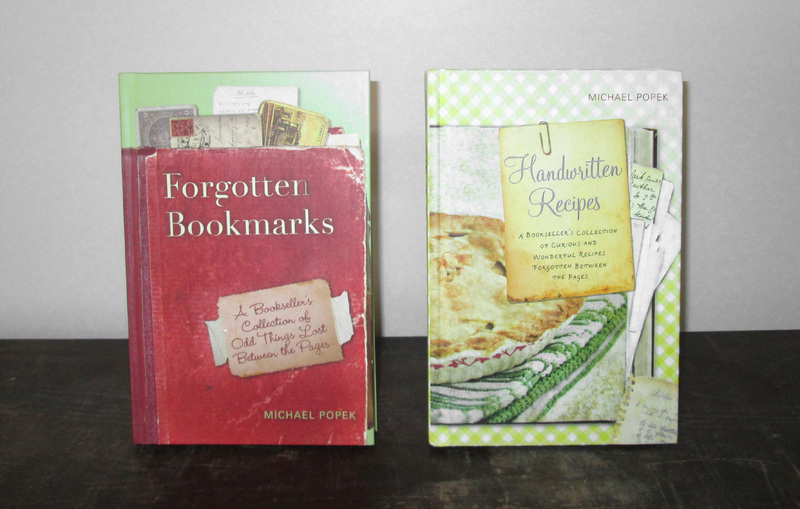 A happy end to the story of these bookmarks and recipes. I've been trying to win these since I discovered your website! Please, pick me! Just found you today, and I'm so pleased I did, because I love found text! Wow! A friend just posted about this on FB and when I saw the book of Handwritten Recipes, I couldn't wait to visit your blog and enter. As a food a writer, a book lover,and a cookbook collector, I would be honored to have both of these on my book shelves--plus, I'd love to sink my teeth in the recipe book and cook up a few old recipes! I've had my eye on your books for a while. Would love to win them. Thanks for the opportunity. Hope I win - Thanks for sharing all the "Forgotten" bookmarks with us. Can I be selfish and say me me me me me me me? It would be lovely to have these...Yes, Please! Very cool! Great additions to anyone's shelf! Generous you! Thank you for offering. I keep buying them for gifts but I still don't have them for myself. Thanks for the chance to win. I'd love to win your books! They sound great! I'd love to win one of the books! I have some handwritten recipes from my husbands mother and grandmother and I treasure them. I love old books! Actually I love all books. I love seeing all of your finds. Would love to win your books! I just LOVE bookmarks, and anything hand written, things of the past really mean allot to me, draw me in, and would dearly love to win this giveaway. Thank you for such a generous gives away! Awesome Would love to have new Books!! Good Luck too All!! I'm a huge book lover! I. So happy my FB friend shared your page with me! Now several of is Love your page! So happy my FB friend shared your page! Now several of us Love your FB page! I would love to win and will hope it will be so. I always dig thru books looking for goodies. What a surprise to find your website. I would love your books. Oh I would love to have these. Thanks. Please add me to the list of those who would like to win these books. I'm so in! These have been on my wishlist for awhile. I am not sure I left a comment in the right spot..that does not surprise me . LOL I would be one lucky lady to win these. Have a wonderful collection of cookery books both vintage and modern. Would love to add yours. I look forward to your Forgotten Postmarks" post, as I am intrigued by who has been reading the book. Thank you for the offer - I'm in. Would love to win your books! I would love to win these, thanks for the chance.